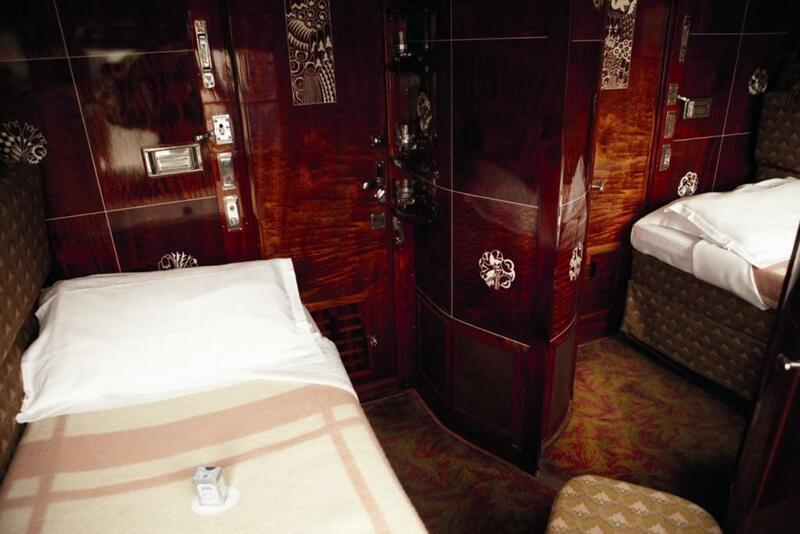 To step on board the Venice Simplon Orient Express is a dream of journey and an exquisite privilege to step back in time to the glamorous era of train travel. “I would like to say that I was born on the Orient Express as my mother took her bi-monthly trip to Istanbul, or that I was smuggled out of China as a tiny baby wrapped in silk and hidden in the guard’s van in a trunk of geological specimens” Lisa St. Aubin De Teran – Off the Rails. Like Lisa who is a self-confessed train addict, I have a passion for the gracious, golden-era of train travel. My partner and fellow world traveller Ken and I have been fortunate to experience several classic railway journeys – the 1920s vintage Al Andaluz around Andalucia, Spain, Belmond Northern Belle (for dinner), Belmond The Royal Scotsman for a marvellous tour from Edinburgh to the Highlands and West coast of Scotland, and an enriching few days on board the Belmond Eastern and Oriental, right across the Malaysian peninsula from Bangkok to Singapore. 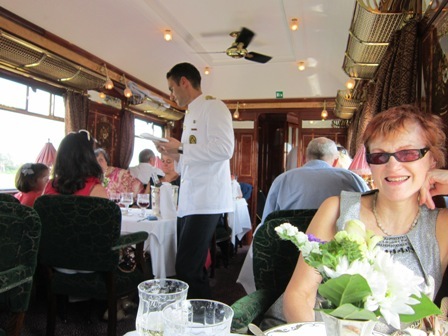 “Welcome …You are about to embark on a journey like no other, travelling across Europe in a fashion redolent of the glamorous 1920s…… to rediscover the sheer pleasure of elegant rail travel. 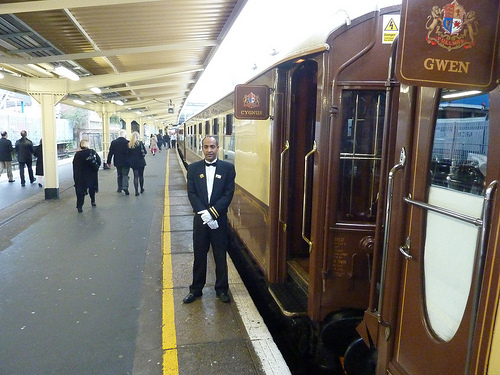 The first part of the journey is from Victoria Station, London to Folkestone, on board the Belmond British Pullman departing at10.45am on Thursday 26 June. 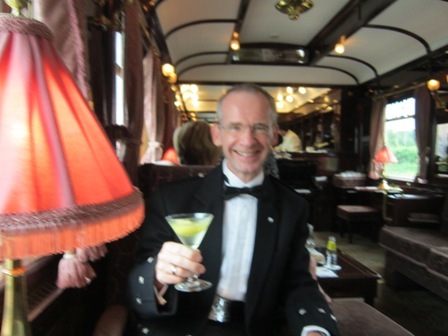 We therefore take the very comfortable East Coast train, First Class, from Edinburgh to Kings Cross the day before, to ensure we are there in a timely manner. The Guoman Grosvenor Hotel at Victoria is a grand Heritage Railway hotel, where train travellers have stayed, wined and dined since 1862. The Reunion Cocktail Bar is the former First class Waiting room. The next morning, the concierge takes care of our luggage and personally escorts us out the side entrance directly onto the concourse and over to Platform 2 on the far side. A few guests dressed appropriately in 1920s – 30s, ladies in vintage frocks and veiled pillbox hats and men in cream blazers and panamas. 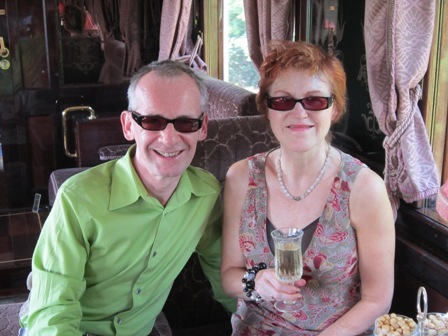 We are very smartly dressed for a summer’s day, but had not thought of such theatrical flair (next time we shall!). “ Everyone was smiling, chattering, wrapped up in the romance and the glamour. They had all dressed for the occasion, and were groomed and coiffed and polished. The air was heavy with scent and cologne and expectation”. Dashing past us are the daily commuters, day trippers and shoppers, pausing briefly to observe, perhaps rather enviously, this distinguished group of travellers, as the magnificent chocolate brown and cream Pullman train, pulls gracefully into Platform 2. Within a few minutes, the doors in the glass partition open and with uniformed staff directing passengers, we are soon walking along to find our compartment, named Gwen. Now we feel like time-travellers, stepping not so much on board, but back to the Edwardian era. 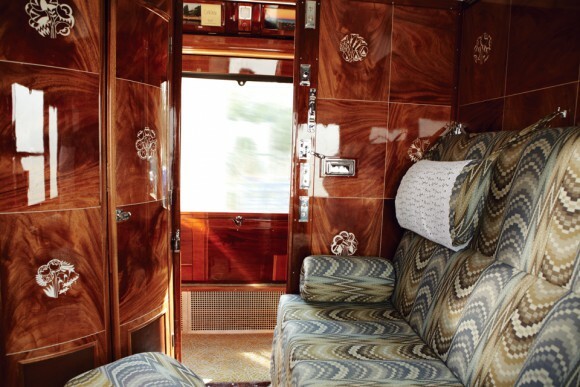 Settling into velvet armchairs, we can admire the plush furnishings, brass, glass lamps decorative pearwood and marquetry of this 1932 carriage. Our table for two is elegantly set with white linen, OE-crested crystal glasses, silverware and fine china; A waiter serves Bellinis, Prosecco with fresh peach juice, invented at Harry’s Bar, Venice – the perfect taster to herald our final destination. 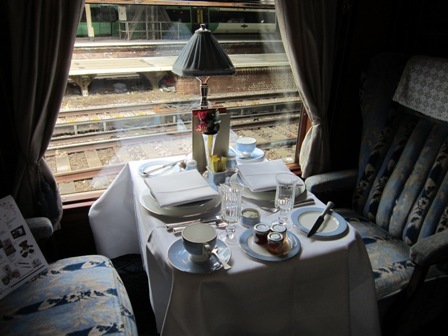 We enjoy a delectable Brunch – fresh fruit, Scrambled Egg with Scottish smoked salmon, pattiserie dessert and coffee – as we saunter at a gentle pace through the Garden of England, via Canterbury and finally reach the White Cliffs of Dover. Folkestone is a pertinent port for the next section of the journey. This was the first link between London and Paris from 1843, when the SE Railway company launched the paddle steamer for the 26 mile crossing to Boulogne. From the Channel Tunnel terminus at Cheriton, we are whisked through the Channel Tunnel by coach on board the dark, windowless freight trains, which is rather surreal. 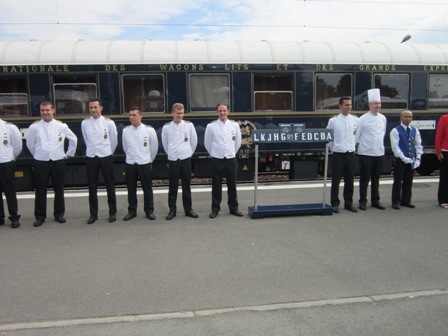 The anticipation is almost over as we arrive at Calais station to see the gleaming Blue and White OE V-S wagons-lit cars, the team of staff standing in military precision at each carriage door. The traditional royal blue frock coats with gold buttons uniform for the Stewards was designed by Balenciaga. 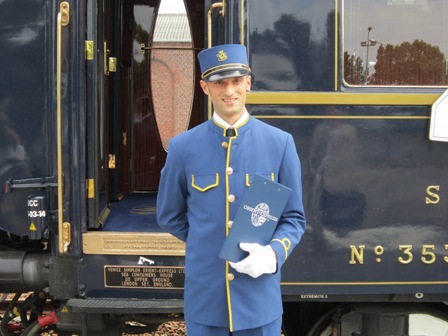 Our reserved Cabin Suite is Carriage D, Cabin 3 and we are welcomed on board by Rupert Aarons, our ever smiling and attentive steward for this iconic journey to Venice. The exquisite woodwork, fabrics and furnishings is all so authentic, especially the vintage porcelain washhand basin hidden in a cupboard complete with fine toiletries and crisply laundered towels. With just an overnight bag we unpack quickly and settle down in our comfortable compartment. A bottle of champagne awaits our arrival. Bliss. Don’t think about booking a ticket if you cannot be bothered taking part in the time-travelling experience. It’s like being extras in a Noel Coward play or a Marple or Poirot film (although hopefully there is not likely to be a murder in the night!) – you don’t have a script to learn, just look the part. As part of maintaining tradition, you are expected to wear formal attire for dinner. 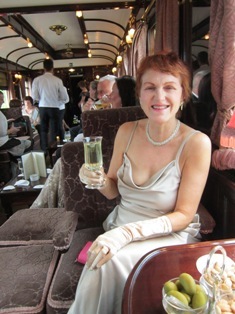 And it’s such fun dressing up in our glad rags and jewels as the train speeds through the French countryside towards Paris; at around 6.30pm we make our away along to the Cocktail Bar where like us, the majority of men in smart Tuxedos and the women in cocktail dresses and evening gowns, with a few in 1920s flapper frocks and boas. The pianist plays all the familiar American song book tunes, while Walter, the senior barman and his team are shaking and stirring delectable cocktails. Ken sampled a speciality martini called Guilty 12, inspired by Agatha Christie’s “Murder on the Orient Express”, a mystery concoction of twelve ingredients. “All my life I had wanted to go on the Orient Express, Trains are wonderful, to travel by train is to see nature and human beings, towns and churches and rivers – in fact to see life”. Agatha Christie, My Autobiography. Like a house party, we mix and mingle with other guests, many of whom are celebrating a special occasion – 50th birthday, honeymoon, 25th wedding anniversary – couples of all ages and nationalities; everyone agrees this is a Bucket List trip of a lifetime. 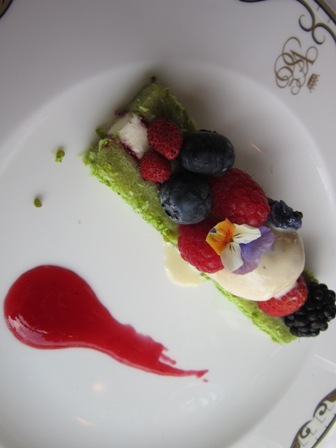 Le Diner is grand, gracious and leisurely: classic French cuisine, (Lobster, Beef Carlois, Fromage, Chocolate noir et creme brulee), artistically presented dishes, beautiful plates, silverware and crystal glasses matched with exemplary service. After a night cap in the Bar, we eventually retire to our small, yet luxurious Suite where Rupert has transformed the daytime sofas into two lower beds with soft pillows, white linen, bathrobes and blue embroidered slippers. 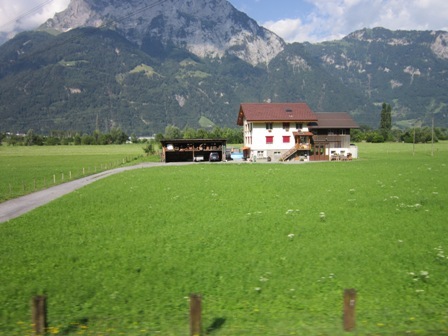 The adventure continues as we slumber, fitfully with the rocking movement, whistles and signal stops, through eastern France and into Switzerland. Raising the blind around 6am the view is of green fields, grazing cows, chalets and mountain peaks. Breakfast, served in our cabin, is Swiss-themed, creamy yogurt, fresh fruit, Emmental cheese with bread, coffee. 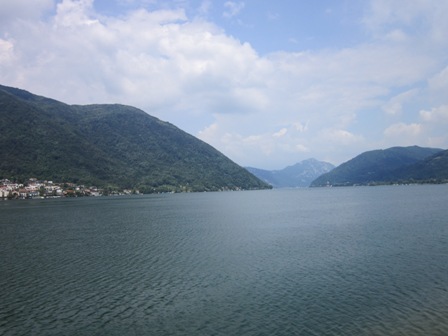 We enjoy a lazy morning browsing the route map and seeing panoramic views of lakes and mountains all the way. 12 noon and time for a Bloody Mary in the Bar, followed by a pre lunch aperitif – an ice chilled glass of champagne – to keep up this glamorous lifestyle. Lunch is a late, leisurely affair after we have crossed the border featuring distinctly Italian cuisine …Caprese Salad, San Daniele ham and melon, Eggs with truffle, Aubergine cannelloni, Pan fried Turbot and king prawns, Black and Red berries & gelato ). 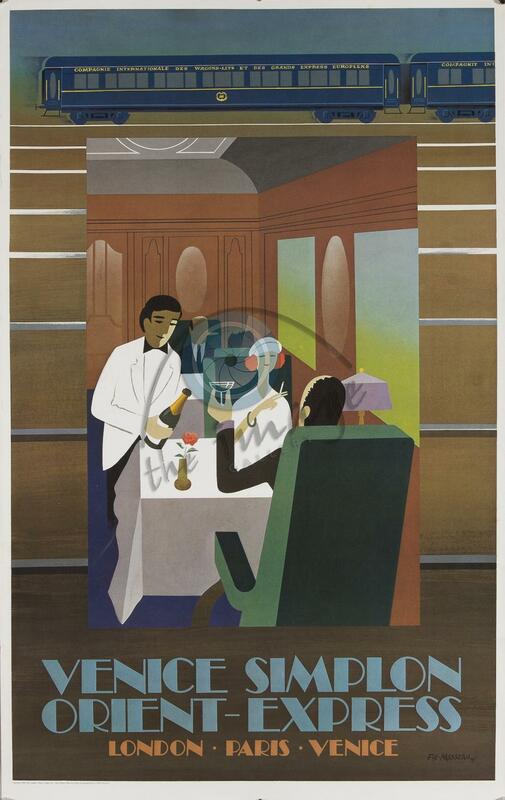 6pm – the train glides gracefully into Santa Lucia Station, Venice on schedule, as stewards and staff rush around assisting passengers with luggage and onward travel arrangements. 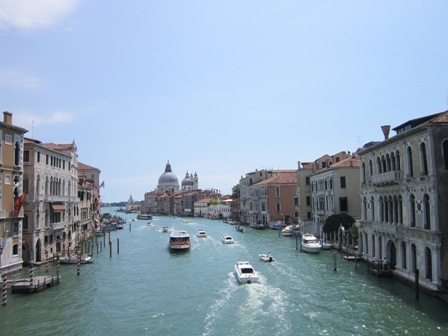 The journey is over but the ethereal beauty of Venice awaits as we step aboard a gleaming teak motor launch to be whisked off down the Grand Canal to our 5 star hotel, the Danieli. 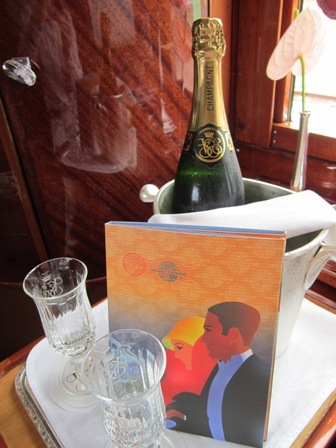 Slow, slow, elegantly sophisticated train travel is the way to arrive in La Serenissima. November in Edinburgh is clearly a time to celebrate the work of Scottish women artists past and present across several National and commercial galleries – the monstrous regiment of women is on the march. 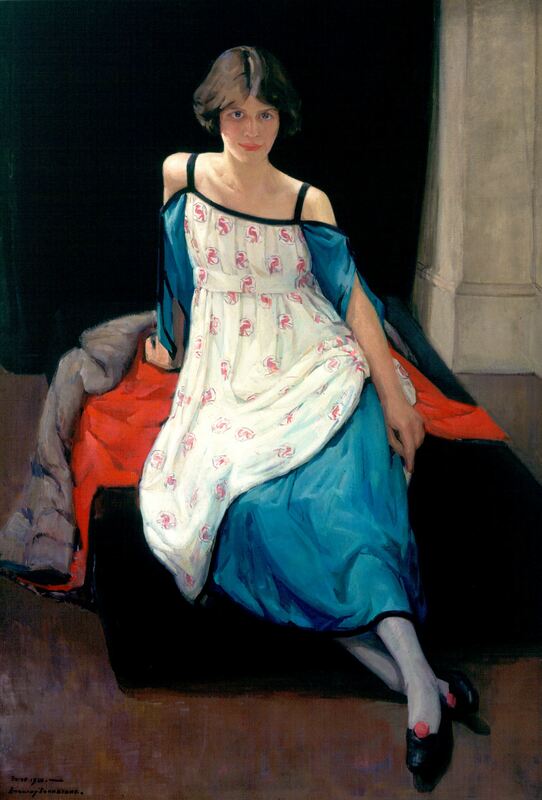 At the Scottish National Gallery of Modern Art, “Modern Scottish Women: Painters and Sculptors 1885-1965” is a major exhibition of work to commemorate artists from the Victorian era to mid 20th century, when an unprecedented number of Scottish women were training and working as artists. Many women artists had relatively short careers or were successful during their lifetimes and have since been forgotten, while other less well known names did not receive full recognition for their talents. The exhibition begins in 1885, the year in which the Glasgow School of Art appointed as its Director Fra Newberry, who was remarkable for his encouragement of female staff and students. It ends in 1965 with the death of Anne Redpath, the leading painter of her generation. (7 November, 2015 – 26 June, 2016). 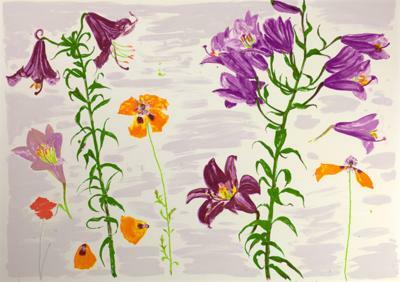 The Scottish Gallery on Dundas Street complements this major retrospective of work with their own selection of Four Women Artists – Elizabeth Blackadder, Victoria Crowe, Alison McGill and Emily Sutton – a diverse selection of still life, landscapes, flora & fauna, and delightful illustrative drawings of domestic scenes. (4 – 25 November 2015). So it is also timely this month to showcase this stunning exhibition by Anna Somerville, a graduate of ECA, who won the prestigious Elizabeth Blackadder and John Houston Travel award in 2000. 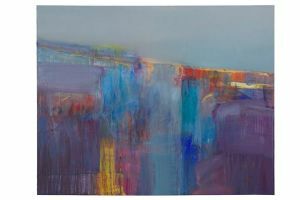 This talented lady has an exceptional eye to re-imagine the reflection of light, soft shade, undulating lines and the shifting perspective of the landscape. 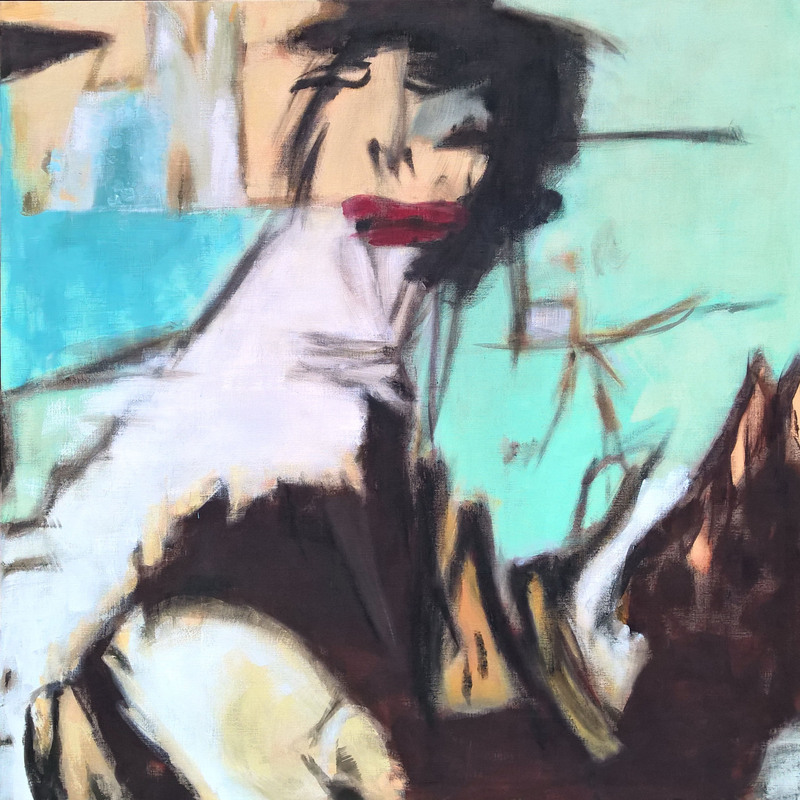 With the wild, carefree approach in capturing cornfields and seashore as Joan Eardley, with a glimpse of the contemporary cubist style of the late Caroline McNairn, Anna Somerville has a refreshingly bold and vivid vision. 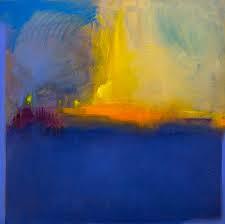 The painting on the left is entitled Imagine -the rich golden orange flare like a spectacular sunset. And below, with the fluidity of soft blue hues, is a fine art print, Waterfall. These landscapes are not literal places, but a meditative sense of place depicting a dreamlike horizon, the expanse of open skies and the sea. As Somerville explains: “When I paint, I am trying to find somewhere but I don’t know where, I am searching with the paint and brush marks”. Take a tram, train, bus, walk or cycle over to the Whitespace Gallery on Howe Street, Edinburgh this week to see these electrifyingly colourful, abstract expressionist paintings which will brighten up Winter nights – and transform that blank wall in your home. The show ends on Thursday 12th November at 4pm, so do try and get there soon!.